The Quest for Height: Grow Taller | Increase Height | Bone Size: Growing Taller with Swimming? Much has been made of Michael Phelps' long torso and has led many to investigate the possibility that swimming may increase height in the torso. And, it is true that since the bones of the spine are irregular an increase in periosteal width of these bones would increase overall body height. Swimming does put shearing forces on the spinal bones especially the freestyle stroke. It is possible therefore that swimming did increase Michael Phelps' spinal height. But, one thing that contraindicates that is that Michael Phelps has a long wingspan. Now there are some short and irregular bones in the hands that contribute to wingspan but Michael Phelps' hand size could not possibly account for his large wingspan(6'7"). Michael Phelps has large feet too(size 14) and the feet are made largely of irregular and short bones(the long bones of the feet do not account for a large amount of shoe size). It entirely makes sense for certain individuals to have long torsos, large hands, and large feet but short arms and legs. The bones that make up the former are largely short and irregular bones and the bones of the latter are long bones. It does not make sense to have long arms and short legs. The explanation for this paradox could be key for height seekers. Their could be something unique in the growth plate histology of people with long arms and short legs that is essential to extending the growth phase. Stop swimming and donate your body to science. These next two studies were based on citations from the study "Endochondral bone growth, bone calcium accretion, and bone mineral density: how are they related?" which flat out stated that swimming and other non-impact exercises increase body height. I have also emailed that author for clarification and got this response "Thank you for your e-mail. Our opinion regarding the effect of swimming on bone length (mentioned in the perspective section of our review) is based on the previous study in young rats by Swissa-Sivan et al. (Bone Miner. 1989;7(2):91-105). Therein, rats were randomly divided into swimming (experimental) and sedentary (control) groups, and bone length was found to increase by approx. 3% after 20-week swimming. In our opinion, swimming did cause bone elongation (i.e., not correlational)." Differential effects of swimming versus weight-bearing activity on bone mineral status of eumenorrheic athletes. "To examine the role of skeletal loading patterns on bone mineral density (BMD), we compared eumenorrheic athletes who chronically trained by opposite forms of skeletal loading, intensive weight-bearing activity (gymnastics), and nonweightbearing activity (swimming) and 19 nonathletic controls. BMD (g/cm2) of the lumbar spine, femoral neck, trochanter, and whole body was assessed by dual energy X-ray absorptiometry (DXA). Subregion analysis of the whole body scan permitted BMD evaluation of diverse regions. Swimmers were taller, heavier, and had a greater bone-free lean mass than gymnasts and nonathletic controls. When adjusted for body surface area, there was no difference in lean mass between swimmers and gymnasts, and both were higher than controls. Gymnasts had a lower fat mass than swimmers and controls. There were no group differences for spine or whole body BMD, but gymnasts had higher spine BMD corrected for body mass than either swimmers or controls. Gymnasts had higher femoral neck BMD than controls, who were higher than swimmers (0.875 +/- 0.105). This result still applied when BMD was normalized for body weight and bone size. Trochanter BMD of gymnasts (0.898 +/- 0.130) was also higher than controls (0.784 +/- 0.097) and swimmers (0.748 +/- 0.085), and remained higher when corrected for body mass." Unfortunately, I couldn't get the full study. So we can't analyze the parameters to see how much was the swimming causal for height growth versus correlational. 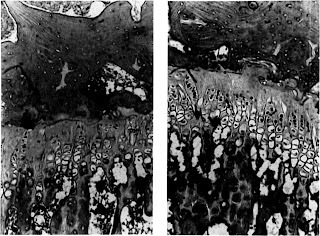 Effect of swimming on bone growth and development in young rats. "The effect of chronic swimming on bone modelling was studied. Forty female Sabra rats (5 weeks old) were randomly assigned to the following experimental groups: 30 rats were trained to swim (water bath 35 +/- 1 degree C, one h daily, five times a week) for 20 weeks--20 of them loaded with lead weights (1% body weight) while the rest (10 animals) swam load free. Ten sedentary rats matched for age and weight served as controls. At the end of the twenty-week swimming period, all rats were sacrificed, both humeri bones were dissected and prepared for the following examinations: morphometric, bone density (BD), bone mineral content (BMC), compression tests and cross-sectional geometrical parameters, histomorphometry and biochemical analysis of minerals (Ca, Pi, Mg, Zn). All measured parameters were found to be significantly higher (P less than 0.05) in the swimming rats irrespective of load, as compared with the controls. Bone weight was higher by 19%, bone volume by 11%, bone length by 2.8%, cortical area by 16%, BD by 7% and BMC by 15%. The compression breaking force at the distal shaft of the humerus was higher by 24% in the trained group, while the ultimate compressive stress was not significantly different. Maximal and minimal moment of inertia at the distal diaphysis were 33.4 and 40% higher, respectively, for the swimming groups than the controls. Ca, Pi, Mg and Zn levels per total humeral bone were significantly higher in the exercising rats. The histomorphometry and cross-sectional data emphasize longitudinal and transversal growth. These data indicate that swimming exercise exerts a positive effect on bone growth and development in young rats." "The forces applied on the limbs during any moment of running can reach values of 6-12 times body weight"
"During swimming no limb-ground pounding is exerted and body weight-bearing action is reduced signiticantly. The gravitational forces acting on the body are counteracted by buoyancy. Thus. the changes that might occur in the long bones could be attributed solely to the stresses applied by muscle contractions during intensive treading water action of the animal, trying to stay afloat." Humeral Length: "30.34(Control) 30.852(Groups that swam unloaded) 31.20(groups loaded with 1% bodyweight)" So the groups with the extra load grew longer arms. "The longitudinal growth of the humerus of trained animals was faster compared to controls. Bone length increased by 1.7 and 2.8% for [unloaded swimmers] and [loaded swimmer] groups, respectively, compared to control groups." Calcium, Phosphate, Magnesium, and Zinc content was higher with increasing load to control group per bone volume and total bone but not per bone dry weight. Exercising group has the larger growth plate. 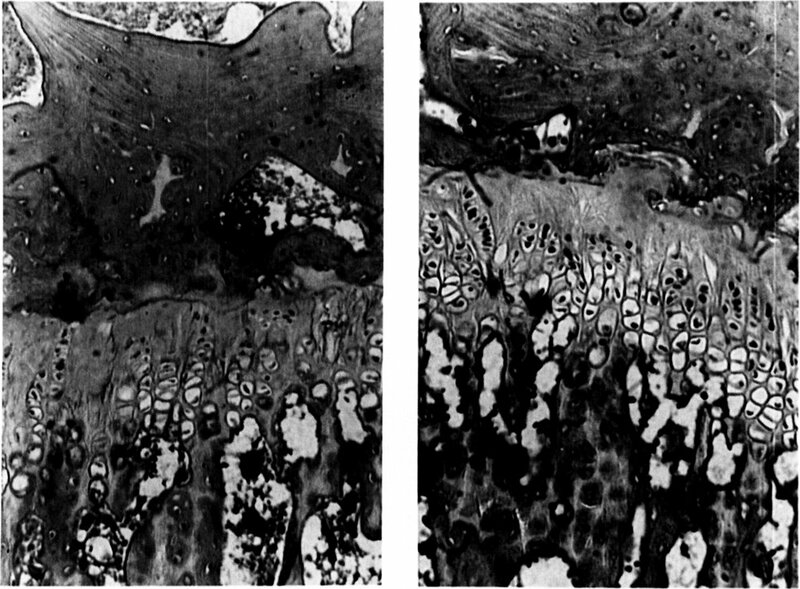 Note that this exercising rat growth plate is different from the LSJL growth plate. But note that the control growth plates are similar in both groups. So LSJL increases bone length in a different manner from swimming. The main difference being that LSJL growth plate is less straight and that the area surrounding the growth plate is more porous with LSJL. "Male Wistar rats (7 week-old) were assigned to one baseline control group, one control group and two swimming training groups, which were trained with 2(LOW) and 4(HIGH)% body-weight mass added, respectively." In this study, versus the other study there was a baseline control group in this group whereas in the other group the control group was rats matched for age and weight. Statement by Narattaphol Charoenphandhu "I agree that these two papers used different method for choosing baseline control. In addition, the duration of swimming protocol in Swissa-Sivan et al. (20 weeks) was much longer than that in Huang et al. (8 weeks)." The duration was longer in the study that found growth. I couldn't get the study The Sabra rat: definition of a laboratory animal. This study would help us learn when female Sabra rats tend to stop growing. The rats would be 25 weeks old at the end of the experiment. Which is about 6 months which is at the point where mouse rats reach growth plate senesence and stop growing which leads credence to the possibility that swimming increased rats adult bone length and didn't just increase growth rate. Histomorphometry of long bone growth plate in swimming rats.
" We performed a histomorphometric study on the effect of swimming on the growth plate and subepiphyseal area of young adult rats. The experiments were carried out on 28 12-week-old albino Sabra rats. One group of 14 rats was trained to swim 1 hour/day, 5 days a week, for 12 weeks. Another group of 14 rats served as controls. The proximal femur and humerus of each animal were examined histomorphometrically. There was an increase in the subepiphyseal cancellous bone trabecullae of the femur. In the growth plate there was an increase in the number of column cells and proliferative cells. These changes were more pronounced in the femur than the humerus. Swimming induces an increase in subepiphyseal cancellous bone in young adult rats by enhancing growth plate activity." Note in this study swimming did not increase the proximal length of the rat femur. In fact the rat femur was slightly shorter in length than the control group. Effect of a five-week swimming program on rat bone: a histomorphometric study. "To specify the exercise-induced changes on different skeletal sites, the effect of a 5-week endurance swim training was studied in rats. Eighteen Lyon strain (Sprague-Dawley) 5-week old female rats were divided into nine sedentary and nine swimming rats. Each swim training session was increased by 15 minutes from 2-6 hours per day. A histomorphometric study was performed at the primary and secondary spongiosa of the distal femur and at the secondary spongiosa of lumbar and thoracic vertebral bodies. After training, bone loss was observed in the secondary spongiosa of lumbar vertebral bodies (24.7%) and in the primary spongiosa of distal femur (15.2%). A tendency to bone loss was also detected in the secondary spongiosa of distal femur (10.8%), whereas no change was detected in thoracic vertebral bodies. In secondary spongiosa, bone loss was accompanied with a thinning of trabeculae. Total eroded surfaces and osteoid surfaces were significantly decreased in the three studied skeletal sites, suggesting a decreased bone turnover. The decreased thickness of osteoid seams in both lumbar vertebrae and distal femur could mean that the osteoblastic activity has also been altered at the cell level, leading to thinning of trabeculae. Five-week swim training with such duration and intensity of exercise appears unable to increase bone volume in rats and, therefore, causes adverse effects. The three studied bones seemed to adapt differently to experimental conditions. The lack of ground reaction forces induced by water immersion might have contributed to the observed bone loss. "Normal" gravity would be an important cofactor in the osteogenic effects of exercise." The effects of exercise mode, swimming vs. running, upon bone growth in the rapidly growing female rat. "The purpose of this study was to compare the effects of two programs of endurance training, of equal duration and intensity, on bone development in female rats. Thirty-eight female Wistar rats were randomly assigned to one of three groups: run-trained (RUN), swim-trained (SWIM) or control (CON). The RUN group ran at a speed of 27 m/min up an 8 degrees incline. Swim trained animals swam with 2% of body weight attached to their tails. Training sessions were 2 h/day, 5 days/week and were conducted over a 10-week period. Hindlimb and forelimb muscles were removed upon sacrifice and analyzed for citrate synthase (CS) activity, liver (LG) and muscle (MG) glycogen. The parametrial fat pads were removed, digested with collagenase, and 2-deoxy-D-[3H]glucose uptake measured in isolated cells. Bone weight, length, diameter, ponderal index and bone mineral content (BMC) were measured in the femur and humerus of each animal. The LG, MG, fat cell volume, glucose uptake of the adipocyte and adrenal weight data indicate that the training response was identical. The CS activity of the muscles indicated that mechanical and recruitment patterns of the upper and lower body differ and could be responsible for bone development patterns found in this study. Exercise had a minimal effect on bone growth in the run-trained animals but did stimulate development in the swim-trained animals. The humerus of the SWIM was significantly (P < 0.05) heavier, wider and had a greater BMC when compared with those of the RUN and CON rats. The results of this study indicate that the muscular forces applied by the swim training protocol produced greater bone adaptations than the forces applied by a running protocol of equal duration and intensity." Both running and swimming increased the glycogen levels of muscles and increased glucose uptake by adipocytes. Running increased citrate synthesis activity more than swimming which is stilll more than control. Swimming caused a minor, statistically insignificant increase in femur and humerus length. Running was statistically insignificantly shorter in femur and humerus length than control. The age of the rats wasn't specified. Physical activity and bone mass: exercises in futility? "In Frost's CGFR[chondral/growth force response curve], increasing compression to the right of the curve increases growth to a peak, after which loads begin to decrease growth (with large enough loads being sufficient to arrest it). "<-although LSJL has been proven effective on mice at 4 months old which are close to the four month senescence point but this theory could explain swimming induced longitudinal growth. "When growing mice from 14 days of age up to 22 weeks were run at a speed of 18 m/rain for 80 rain each day for 12 weeks, larger and heavier femora were found. But when the duration was increased to 21 weeks, or for a duration of 120 min/day, femora were shorter and lighter than those in the control group." "Forty-two 9-mo-old female rats were either sham-operated (Sham) or ovariectomized (OVX). Three months after surgery, the rats were divided into the following groups: Sham sedentary, Sham exercised, OVX sedentary, and OVX exercised. Rats in the exercise groups jumped 10 times/day, 5 days/wk, for 8 wk, with a jumping height of 40 cm. Less than 1 min was required for the jump training. " "jump exercise generates high-impact loading before the rats leave the ground." "OVX and training did not affect tibial length." Running mice had access to running wheels in cages. The length of the femur began to decrease in the running group between 4-6 months of age. Bone length was the same for control and running groups between 1-4 months of age. "male Swiss Albino mice (4 weeks old)"
"The mice within their cage in the running training group were placed on the flat bed treadmill, the speed of which was constant at 15 m/min, on a plain floor. An electric grid at the rear of the belt was used to create a stimulus for the mice to run. All mice ran 5 days/week for 12 weeks. Each running training period lasted 30 minutes." "The lengths of the femur and the tibia were significantly greater for mice in the running training group" The exercise group increased 50% more in femur length than the sedentary group. Effects of exercise on bone growth mechanical and physical properties studied in the rat. "Thirty-four pubescent male rats were divided into exercise and control groups to examine the effects of a 1-month intensive exercise programme on the mechanical, physical (group 1) and histological properties (group 2) of the tibia and femur. At the completion of training, rats were sacrificed and the right hind-limbs dissected and stored at -60°C prior to torsional-testing at a speed of 180/s. Left tibiae and femora were measured for length and weight' Values for the width of the epiphyseal plate were also obtained from animals in group 2. Following the exercise programme the tibiae showed significant reductions in energy absorbed to failure, bone length and width of the proximal epiphyseal plate. No change was observed for the mechanical properties of the femora, but significant reductions occurred in bone length and weight. " "The training schedule consisted of a l-month intensive exercise programme of treadmill-running (1 h/day) and swimming (1 h/day) 5 days per week"
It's possible that exercise merely slowed down growth and did not decrease height potential. so i dont undestand do we get permanent height or no???
" Swimming does put shearing forces on the spinal bones especially the freestyle stroke. " But doesn't the disks absorb any form of force? If that's so how come the vertebrae are still growing via swimming? This is a possible way to explain why stretching works. Comparing swimming with gymnasts was not a smart move by the researchers. Due to the lower center of gravity, and the fact that almost all gymnasts are below average in height (with the exception of a few like David Robinson) it was clear from the very beginning that bone density in gymnasts from regular jumping and tumbling would have differences with swimmers. That's how height increase works in his theory. Grow taller by eating deer antlers?